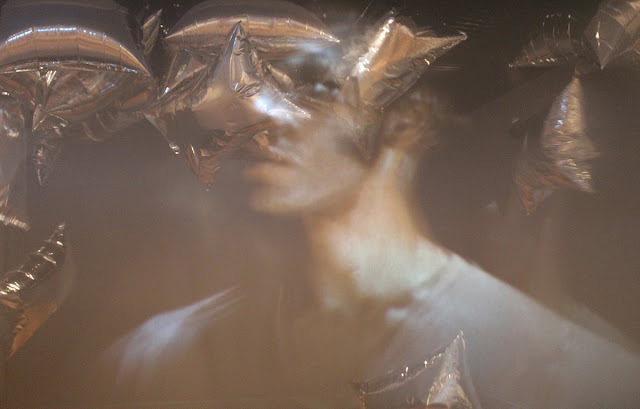 Back in June, I posted a photograph I took inside an installation at the Detroit Institute of Arts. The installation, a multimedia immersion in the 1968 Merce Cunningham dance RainForest, was part of Dance! American Art 1830-1960, a fine exhibition organized by the DIA that included mostly representations of dance in visual art, but also a handful of notable works related to dance as an art form itself. 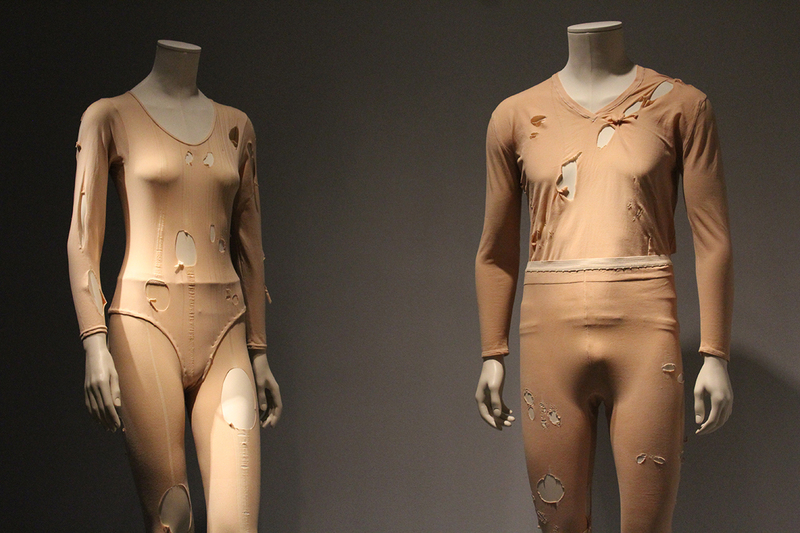 RainForest, like many Cunningham dances, is notable in part for its incorporation of work by other prominent New York artists. 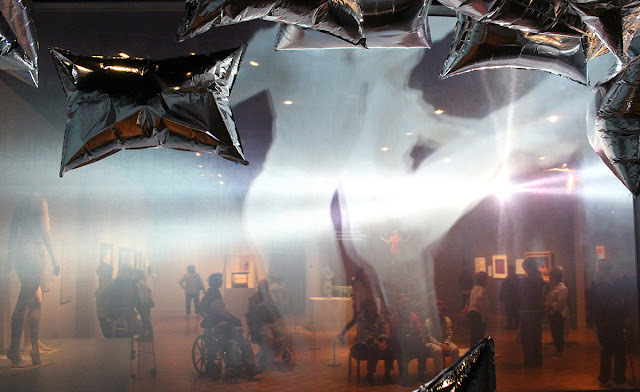 The costumes, two examples of which were included in the exhibition, are by Jasper Johns, and its famous decor — silver, helium-filled Mylar pillows — were designed by Andy Warhol. Recreations of those pillows were central to the installation, which was essentially a room, defined by a curtain, two walls, and a scrim. 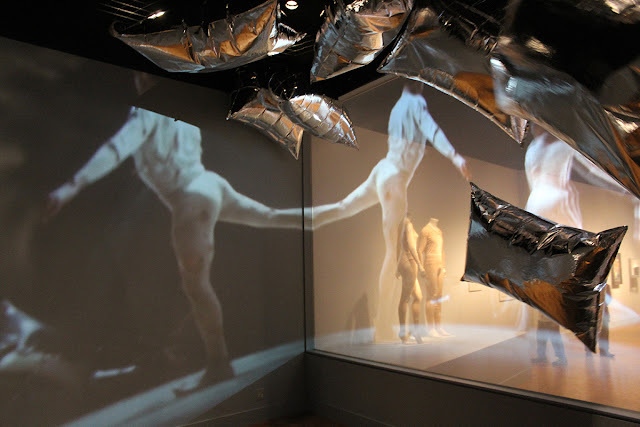 The pillows floated along the ceiling and billowed about the room, while a 1968 film of the dance was projected onto the scrim, but also through it, onto a solid wall, creating a mirror image. 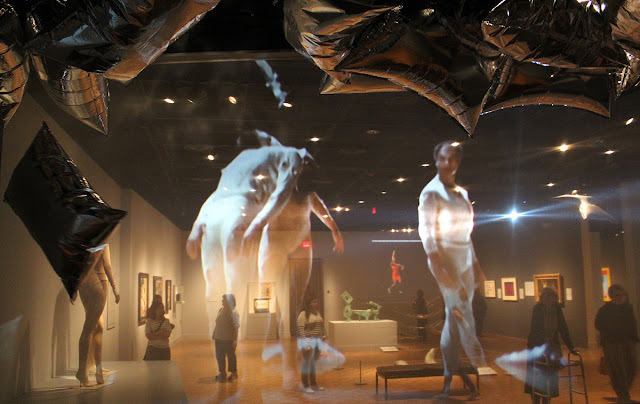 The viewer could either consider the work from outside the room, looking at and through the scrim, or from inside, a gently chaotic, multilayered environment in which the predominant sense was of existing inside some version of the dance itself. This was not, after all, a reliable record of a dance, but something new and more complex that shifted between past and present: something that enveloped, even overwhelmed the spectator, whose eye zigzagged from the pillows above to the recorded dancers' spectral, larger-than-life bodies in motion, to the bodies of the people on the other side of the divide: walking, standing, sitting, watching. This textural layering advanced an engaging and noteworthy approach to the presentation of historic dance works in a museum setting, outside of live performance, carrying RainForest forward in a sensitive and respectful way. It also made for a naturally inviting opportunity to take pictures, so after seeing the exhibition once, I returned, during lunch on a weekday, to shoot. 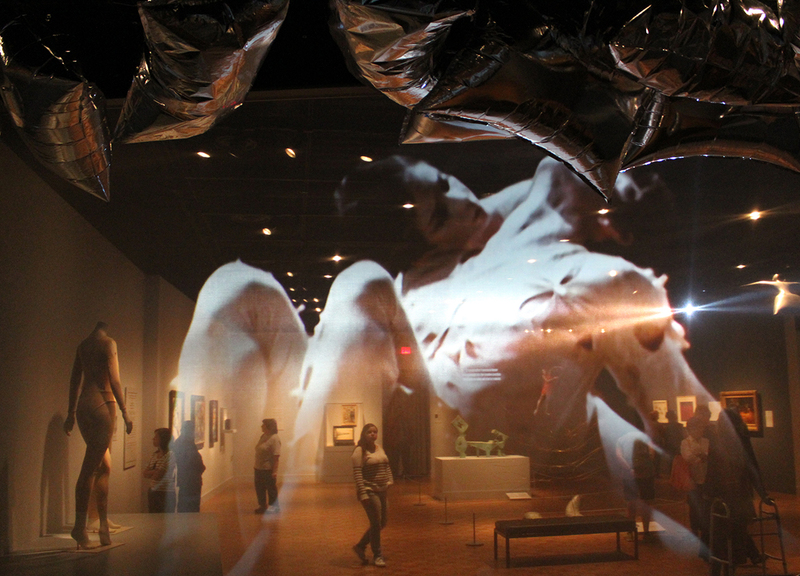 For this opportunity, too, I thank the DIA, which encouraged museum-goers to take and share photos of the Dance exhibition — an unusual invitation, as far as special exhibitions at major American art museums go, and a nice example of the DIA's ongoing commitment to accessibility. It's unusual for me to be in the museum on a weekday afternoon. I was surprised by how many people were there, and struck by how many of those people were seniors. It was an unexpectedly poignant experience, watching elderly people, many of whom moved slowly around the museum with the help of wheelchairs and walkers, absorbed, for a time, in the breathless, exhilarating movement of the dancers. Another layer: unpredictable and unintended, but resonant, nonetheless.